We had a nice campsite under a steep striped wall in Hackberry Canyon and we were off hiking at 8am down canyon. 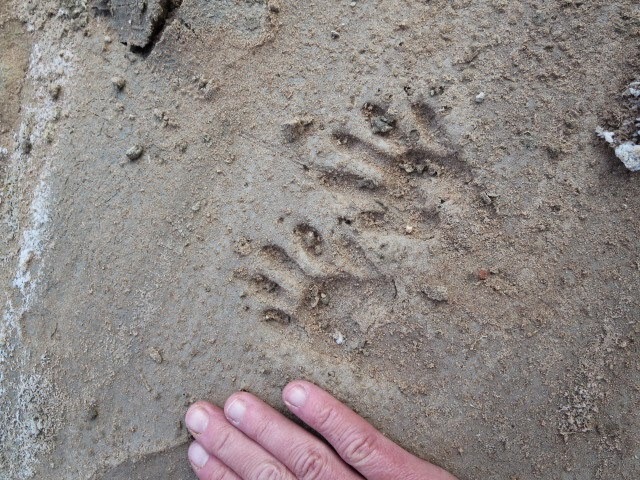 We followed the now running river, sometimes down the water itself with some trails on either side and willow bashing. 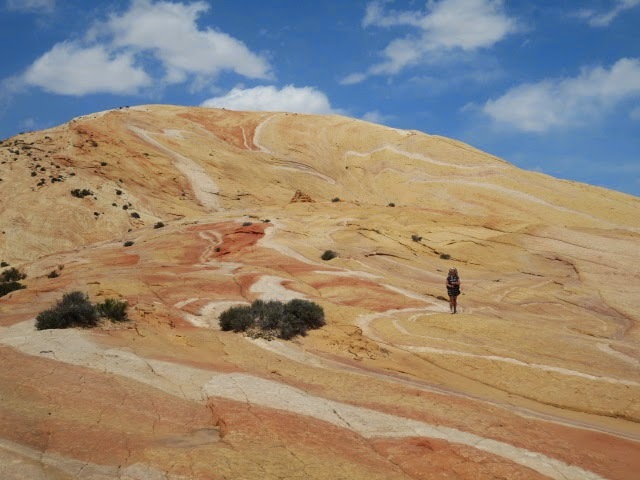 It was pretty easy going though amidst lovely green lush riparian scenery and varied colorful walls of deep red along with yellow/grey/blue bands (probably Chinle?). As the canyon narrowed further down we met some day hikers coming up from the Cottonwood Wash trailhead we were nearing. Seeing people is a good sure sign that there is road access nearby! We popped out of the canyon at the trailhead and wandered down about 300m into a small ‘box canyon’ for some lunch. This is where we wanted to head away from the Hayduke route again for a 2-3 hour longer alternate up above the canyons past some colorful rock features (described in our Notes for Hikers website as the ‘Yellow Rock’ alternate). 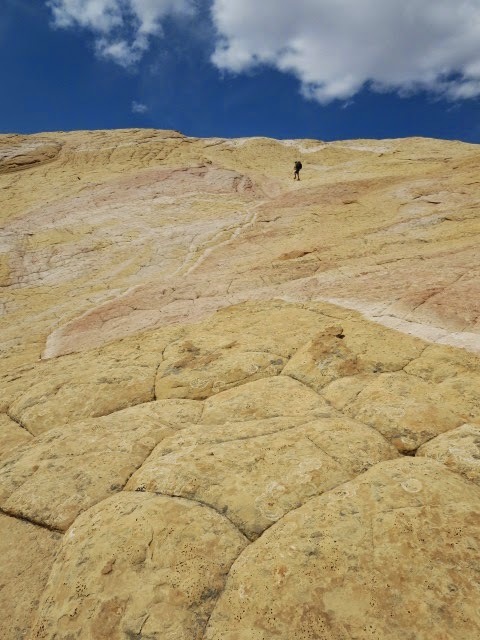 ‘Yellow Rock’ really does not do it justice! It should be called “orange and pink and yellow swirly rock” and is a splendid surreal landscape of stunning vibrant colors. The wind was wild up there though- maybe 40 mph- so it was difficult to linger to long. 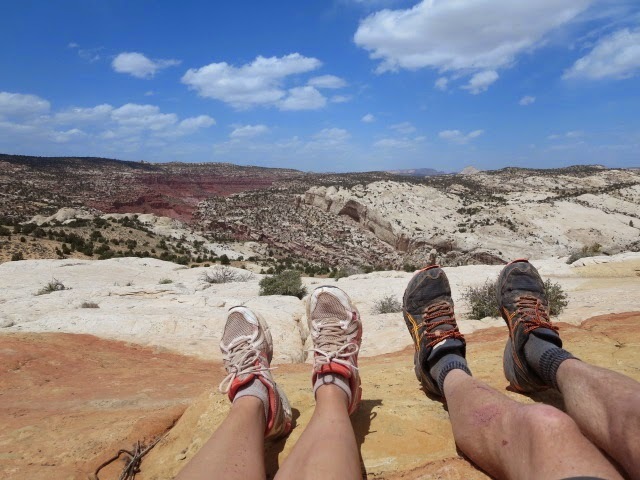 After Yellow Rock itself we crossed a rugged plateau full of white sandstone lumps and pumps with some cross country and faint trails before finding a better trail that took us to an overlook above the wide valley of the Paria river. 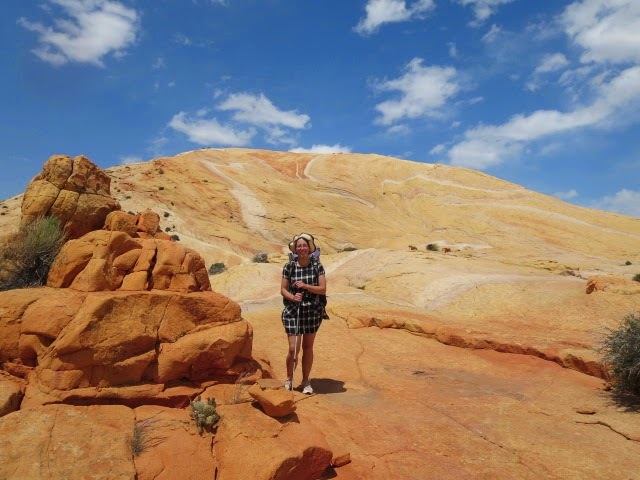 The Paria is a Paiute word for ” muddy river ” and it really was – like orange milk – the early European settlers said it was…. 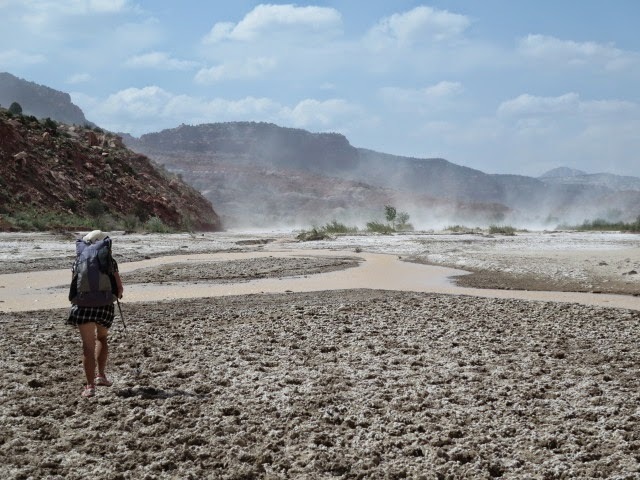 By the time we had descended to the Paria, the regular afternoon wind had started up kicking up dust storms mixed with alkaline white salts that coat the ground. Not a welcoming place! It had its charms though as it was bordered by bright red banded rock and narrowed to a more amenable canyon as we headed upstream. 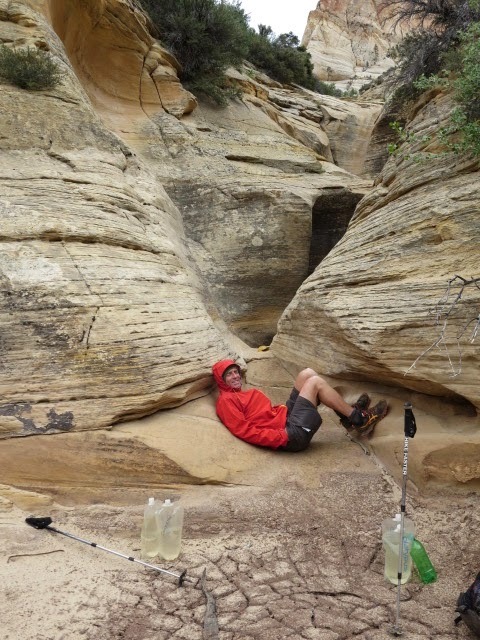 We found a place to camp in a vegetated silty side canyon, Kitchen Creek. The trickle of stream was heavily polluted by cattle but Martina found a little fresh spring bubbling into the side of the creek and we took our water from that. After a good sleep we headed back along the Paria at around 7.40 am. Our route upstream involved many river crossings and the water was frigid at that early time in the morning so we kept a fast pace up to keep warm! 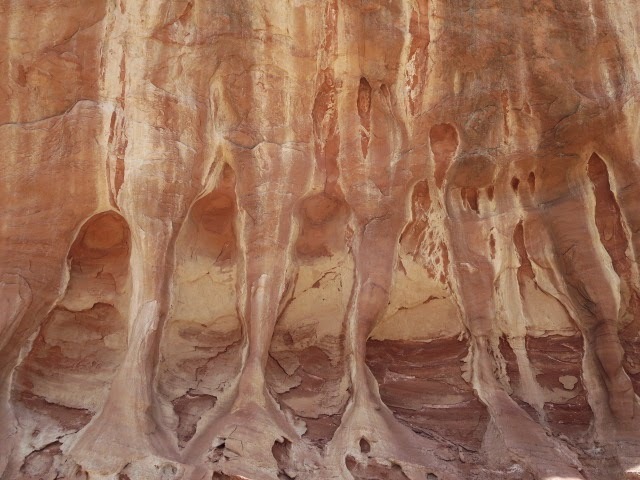 The canyon scenery gradually improved as we headed up, the walls closed in and the rock turned redder and redder. 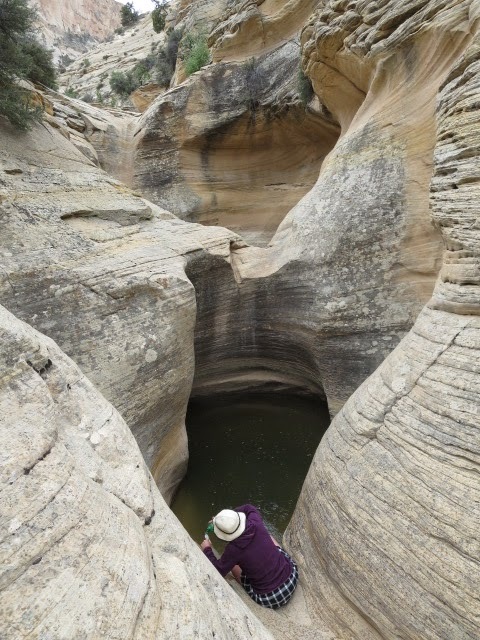 We took a a nice stop in a big rocky alcove with hummingbirds darting by and Martina was delighted to find a small well preserved skull – possibly a ground squirrel. 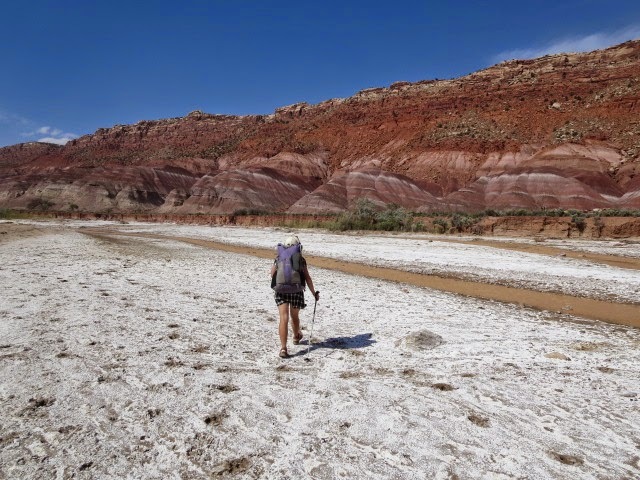 By mid-morning we headed out of the Paria and into lovely Sheep Creek which had it’s own character- white rock, tall ponderosa pine and a clear stream at last! 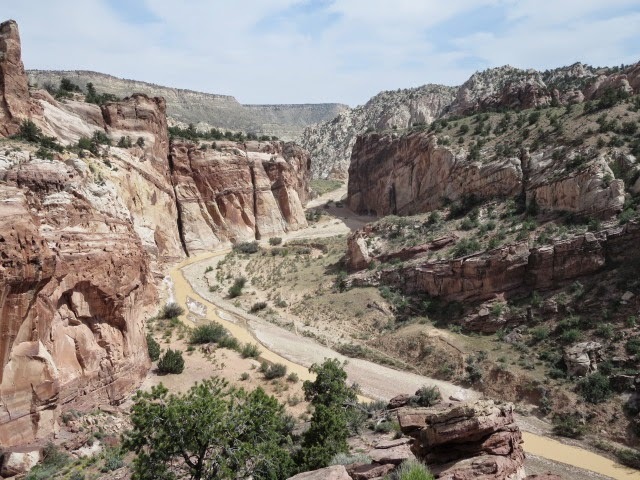 We split from the Hayduke route again here for another longer alternate up Bull Valley Gorge to the west of Sheep Creek. For the first 3-4 miles or so this is a grand hike up a dry wash of a twisting wide canyon – somehow with a big mountain feel – we even saw bigger trees lining the rocky walls Douglas Firs perhaps. Three people we had met in Sheep Creek had told us about a pothole water source up here. We were delighted to find it and tanked up with water to do us through to tomorrow afternoon where we hoped to hit the town of Cannonville again. Continuing up valley rain started to fall. It was still raining and the skies were foreboding when we arrived at the start of the two mile slot canyon section of Bull Valley Gorge. Wary of the risk of flash floods and the lack of escape routes once in the slot canyon, we were a bit nervous but decided to go for it anyway- we were committed! The gorge narrowed impressively, but the rain poured down more heavily and water started running off the walls and puddled in the floor of the slot. We took shelter a few meters up on a ledge in case a flood came through and waited for half an hour or so. But with no change in weather we decided just to keep going as fast as we could through the remainder of the slot. A few sections of scrabbling up boulders and tree branches that blocked the canyon and slowed us down, but eventually we escaped out and were grateful to climb up onto the canyon rim rather soaked and bedraggled! We set up camp next to a jeep road in cold, still wet conditions. We saw Bryce Canyon, our next destination ahead, but covered in fresh snow! Like the dust devils photo. Very atmospheric.